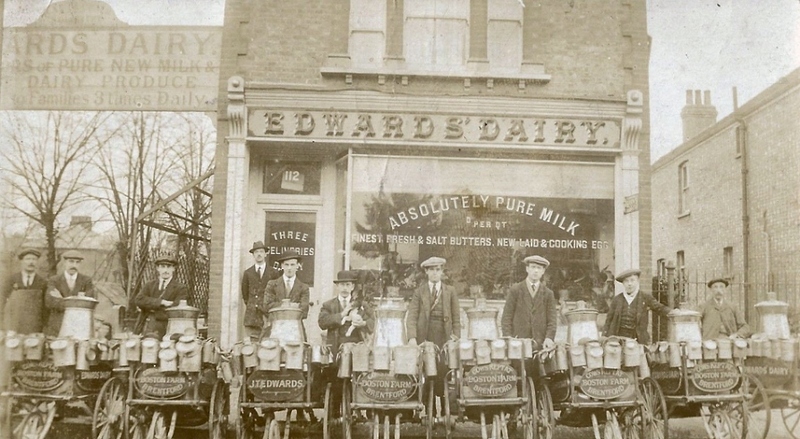 Thanks to Peter Stuart for this sepia postcard image which shows Edwards' Dairy at 112 Windmill Road, Brentford. Proudly on show are (presumably) JT Edwards and nine employees - one holding a rather mobile dog - with eight hand carts, churns and milk cans required to meet the demands of local families - signage notes they made three deliveries a day. As well as milk they offered salt and fresh butter and "new laid and cooking eggs". The milk came from Boston Farm; an early 1900's postcard shows this part of Boston Road was still a rural area. As to dating the image, Kelly's Directory of Middlesex, 1914 lists J T Edwards Limited, dairymen, 112 Windmill Road; however they were not long established as Kelly's Ealing, Acton, Hanwell, Brentford, Gunnersbury and Chiswick Directory ("Buff Book") for 1911 records Willison's Ealing Park Farm Dairies Limited at this address.